One of the things I like about Thailand is its 7-Eleven. Alright, you would probably wonder why 7-Eleven and it is not even originated here. Well, Thailand has this talent to take a foreign franchise and make it better than the original. 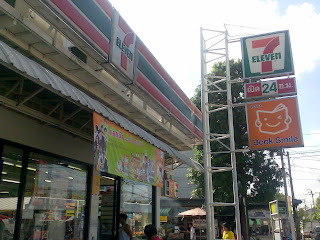 First of all, 7-Elevens are everywhere in Bangkok and the local call it ‘7’ (I don’t know why). For example near my office on Silom, there are 4 7-Elevens on a stretch of 20 minutes walk. They come in various sizes, range from compact size to big comfortable space. It is literally a ‘convenience store’ because it is really near to where ever you are. Nearby my house, there are 3 7-Elevens within 3 minutes of driving from my house. And another one is 5 minutes walking distance from my house. There are more than 30,000 branches in Thailand! When you enter a 7-Elevens here in Thailand, after hearing the ‘ding-dong’ from the door chime, you would be greeted ‘Sawasdee Kah!’ by the cashiers. They certainly make shoppers comfortable shopping here. Some shops also play music for your shopping pleasure. I am really impressed by the variety of goods they sell here in 7-Eleven. You can expect to find your normal snack, beverages, bread, stationary and etc here. 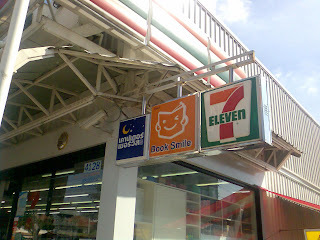 Besides that, you can also find a section call ‘Book Smile’ in bigger shops that sell magazines, newspaper, CDs and books. In terms of food, some 7-Elevens also have a food counter that sell warm “bao”, hot dog, burger, coffee, and also provide warm water for instant noodle in foam cup. There is also a frozen food area where shoppers can find frozen food such as rice with dishes, eggs, dumpling soup, salad etc. Basically, the list goes on and on. Every month, 7-Eleven will have special promotions. There are things you can buy with very low price when you purchase up to a certain amount of merchandise. Most of the 7-Elevens here also have an ATM for your convenience. And if I am not wrong, I think they even have 7-Eleven Value card! I will have to find out about it. So when you visit Thailand, feel free to stop by a 7-Eleven. Haha... not trying to promote their '7', just stating the fact and sharing what I see in Bangkok. In comparison, KL's 7-11 is really pathetic! Oh, yeah, Boots is a good place to shop too.. almost like Watson's, but Boots is from the UK, I think. I think the '7' don't have what a big difference compare with Malaysia ones right. The most impressive is the 7-Eleven Value Card is provided.